Once upon a time there was a very shy little girl, who loved books and the sea. She was fascinated by lighthouses: tall structures that emitted lights through a series of lenses, to help ships find their way safely through treacherous waters. Grace Darling was her heroine, and she wondered what it would be like to live like her, on a small, inaccessible island, visited only by supply ships. It was the story of Tom, a young man who came home to Australia after the Great War and became a lighthouse keeper, on a remote island off the coast of Western Australia. He loved what he did for the same reasons that I loved lighthouses as a child, and he found that his island helped him to put the breakdown of his family and the terrible things he had seen in the past. On shore leave he met Isabel, and after a long courtship – inevitable when shore leave was so rare – they married, and Tom brought his bride back to his island. She loved it as much as he did. They were very different – he was old for his years and sensible; she was young for hers – but they loved each other, they complemented each other, and their relationship worked. I believed in it, I believed in them, I believed in their life: everything rang true. Their island came to life, and I think I loved it as much as they did. But their happiness wasn’t complete. Isabel had more than one miscarriage, and a still birth. It was not long after that still birth that a dinghy washed up on their little beach. It held a dead man and a tiny baby, wrapped in a woman’s cardigan. Isabel knew that the baby was meant to be hers. Tom was concerned, but in the end he couldn’t deny his wife what she had wanted for so long, what she thought she would never have. It wasn’t difficult; their only regular contact was with the boatmen who brought supplies every few months. And after all, the child’s father was dead and surely her mother must be too, for the child to be alone with her father in the dinghy. But when their child, Lucy, is two years old the family travels to the mainland on shore leave. And they learn of a woman who had lost her infant daughter in tragic circumstances two years earlier. A woman who was convinced her daughter was still alive and would not give up hope of finding her. Tom’s doubts about what he and his wife had done came flooding back, and he came to believe that they had, somehow, to return the child. But Isabel refused to even consider the idea, never doubting that the child was their gift from God. Their relationship began to fracture, and their secret began to escape. The consequences were devastating. For the couple whose child was pulled away from them. For the child who was pulled away from the only family, the only home, she had ever known. And for the mother who found that the child who came back was so different to the child she had lost. And for all of the people around them. 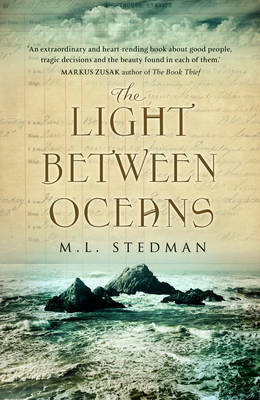 M L Stedman handles her material beautifully, illuminating all of the sides of her story with honesty and compassion. There are so many emotions, deep and complex emotions, and there are no easy answers. The story was cleverly structured, it was utterly involving, and it asked some searching questions about where the line between right and wrong really fell. Setting the story in the aftermath of the Great War gave it extra power. A community had come together, suffered losses together, rejected outsiders together, and all of this had such consequences. At times I was infuriated – by Isabel in particular, and by others too – but there was always something, some real human emotion that pulled me back, that made me understand. And that held me to the very end, feeling so many emotions, feeling so very deeply, wanting the best for all the characters I had come to understand and care about, but knowing that, maybe, that wasn’t possible. The ending wasn’t obvious, it wasn’t perfect, but it was right. This is an extraordinary debut novel. You have such a gift for describing books and your feelings about them! Adding this to my list. My goodness, this sounds like an amazing book – I’m also adding it to my list! I did not consider the aspect of setting a story in a particular era i.e. World War II giving the book a deeper aspect. Now that you mention it, yes of course it does. Thanks for this review. For me this is one of the best books of the year. It was heartbreaking and beautiful all at the same time. It made you think so strongly between right and wrong. Also I loved the isolation described by the author of the book, I felt I was on the island with only the lighthouse for company. Your review really sells the book and I recommend everyone that can read it, should. I am sure you will get lots out of it. I look forward to the author’s next novel. I have to stop reading your excellent reviews and start reading this book 🙂 I know I am going to enjoy this one, love your review and just know this is one for me. What a lovely post! I have never heard of this book, but when I was a little girl, I too was fond of stories of islands and boats and lighthouses. I think I will be reading this one. A lovely review. Oh my goodness this sounds heartbreaking! This sounds fantastic! I’ll have to see if my library has it.